There were few shows I was looking forward to more in 2018 than Fate/Extra Last Encore. Years ago I played through the original Fate/Extra game and really enjoyed it. This was a fresh bit of terrain for the Fate franchise that really pushed some boundaries. They went in a very different direction in terms of setting and that made for an interesting ride. The game itself had pros and cons on the gameplay side, but the story was good. I was really interested in seeing just what they were going to do with it in this anime. There was no telling right away about whether it would be a sequel, pure adaptation, or something else entirely. I will say in this early part that I really enjoyed it. Though that should be clear enough from the score it got. I’m not sure this show requires having played Fate/Extra to get into it, but in a lot of ways I think the experience is enriched by that background knowledge. This is also a show that doesn’t peel back the layers of the mystery very quickly. It is only a single cour when all the episodes are put together. So I don’t think it was a problem for the show to take its time on certain points. I enjoyed watching episodes and pondering the questions it raised. The show gives a lot of chances for you to draw your conclusions and speculate about what is going on. For some I can buy that being confusing if not frustrating. But I had fun watching the show reveal answers slowly. This is certainly the most “out there” setting for the Fate franchise. We’re not talking about the original series and the battles taking place in Japan. This isn’t even taking place on the planet Earth. Now we’re not talking about a show happening on Venus or another solar system. It isn’t going that far out there. But rather this is a very different setting with a different history in general. Even Fate/Apocrypha had a similar core history and honestly even the Fate/Kaleid series are more similar in basic world building than Fate/Extra. In this case within the moon is the Moon Cell and that is basically a kind of supercomputer that actively observes the Earth and has been doing since its formation. This setting is very much out of the familiar terrain for this franchise. Now within the Moon Cell is an artificial environment called the Serial Phantasm (SE.RA.PH.) and that is where the story of Fate/Extra Last Encore takes place. Individuals on Earth with the capacity to become Masters can essentially hack into the Moon Cell (thus being called spiritron hackers) and access this artificial environment. They have their own kind of magic (called code casts) and thus are very much this series’ version of mages that you would see in any other Fate franchise. So just the setting of the Fate/Extra story is pretty out there. A lot of the story is a mystery and is revealed in time so going heavily into the story is difficult. But this review also is part of my desire to discuss the show more and will just have to avoid spoilers while doing that. 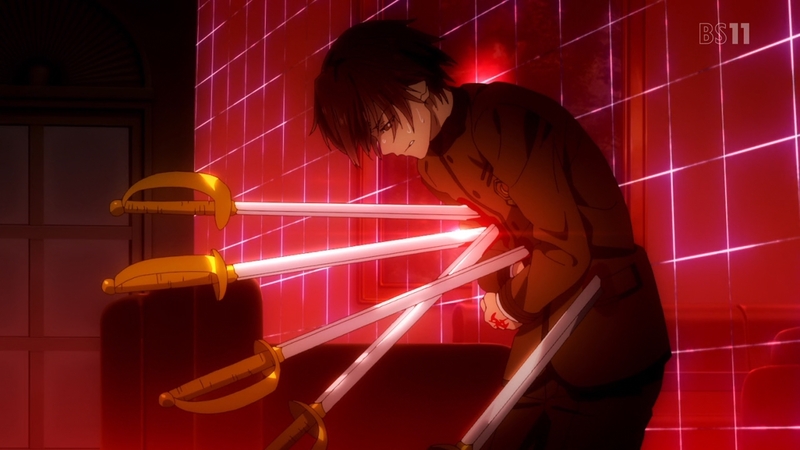 The show is very much one of the personal journey of the main character Hakuno and his servant Saber. Servants of course in the Fate series being historical or mystical figures that can be summoned and fall into a handful of classes. The story in a lot of ways is a mystery. 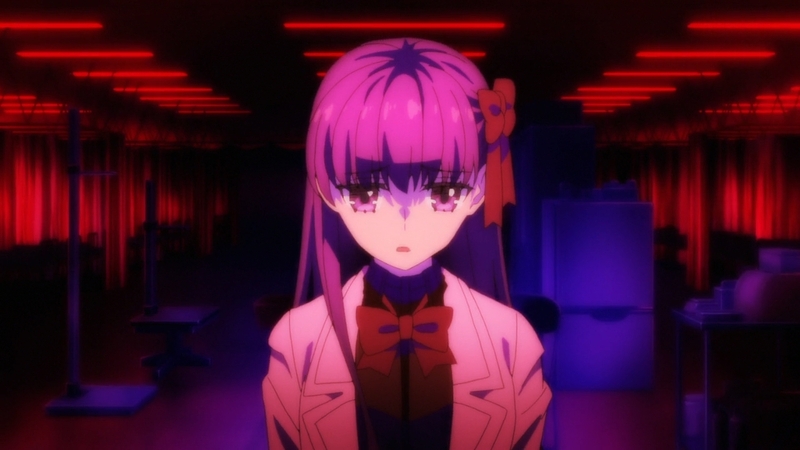 How it ties or relates to the Fate/Extra game being one of those mysteries. Hakuno needs to progress through the various floors/layers of this digital environment. As he goes mysteries are revealed and more questions are also raised. In a few ways the story has a specific formula. Hakuno stays on a certain floor for usually a couple episodes. 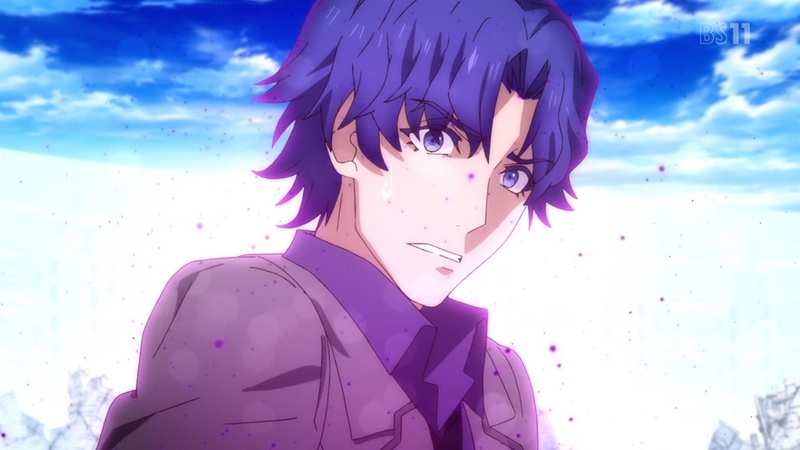 He finds out more about; the situation, himself, Saber, an opponent he must overcome on that floor, and eventually makes his way to the next one. Now I don’t actually mind a show having a specific pattern or formula. Hakuno has a certain amount of ground to cover and only a certain amount of episodes to do it. While spending more or less time on certain floors might have worked just fine, I don’t think the show really needed to. It allows the show to have a certain pace to it and keeps things moving. The story has some twists to it. Some of those twists caught me by surprise. And I’m a bit of an unique beast maybe in that I really enjoyed going through the episodes a few times. There was a lot to take in and a lot of key points or symbolism shown off in an episode that didn’t immediately make itself clear at a first glance. I wouldn’t say that people failed to comprehend this show, but I do think some things could easily be missed if you weren’t looking for them or stopping to think about them. That could definitely hurt the potential for wide appeal. But I had a great time going back to rewatch this show and picking up on hints or passing phrases that revealed quite a bit about what was going on. For me the story was a huge win. This gave me a really fresh experience with the Fate/Extra story that I didn’t expect going in. They didn’t just do a basic adaptation, but rather took that story and did something with it. It’s hard to say exactly what without spoiling things though. This story gets interesting, weird (it is adapted by SHAFT), tragic at points, and also a bit hopeful. I don’t think this story is for everyone and honestly it might be tougher for those who didn’t play the game to really get invested in. But I think the story clears the mystery by the end and allows for a satisfying conclusion. The characters in this show really can be broken up between the main cast and the antagonists. Focus remains pretty tight on Hakuno and Saber through the majority of the story. Nothing shocking there of course being the main characters. I’d also consider Rin and Rani to be fairly important characters. Hakuno and Saber don’t exactly have a multitude of allies and friends so it is fair to say those two that occasionally help them out are rather appreciated. The most interesting thing for me in this series is the journey of Hakuno. He very much starts out as the type of character that feels like a blank slate. And yet the interesting thing is that he isn’t entirely blank. There is a lack of emotion with him in the early going except for a bubbling rage that he doesn’t really understand. Now if he was like that for the whole show it would be rather boring. Not going to spoil his character journey, but he does develop as a person as he goes along. 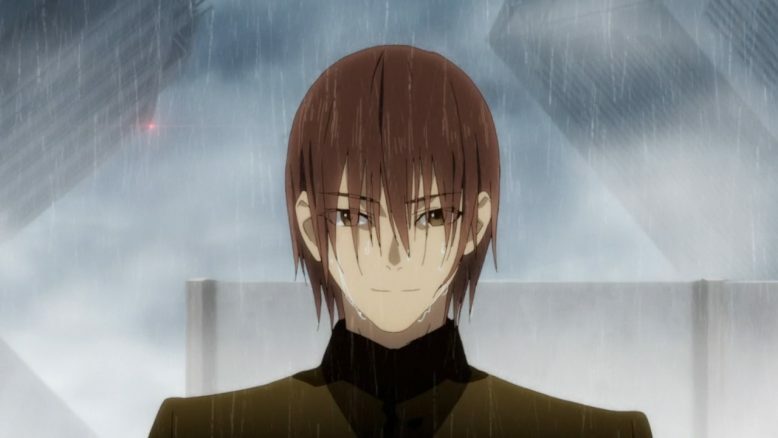 While I’d never deny his servant Saber being my favorite character of the show, Hakuno did surprise me with how much I liked him by the end. 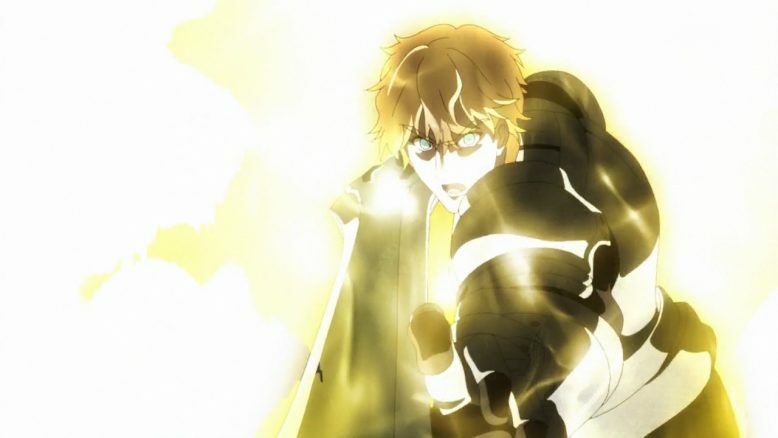 Hakuno is a pretty active master in terms of fighting his own battles. But I wouldn’t say he’s the type that ends up fighting servants or straight up stealing the show like in say other Fate series. What he can and can’t accomplish makes enough sense as things are explained. He doesn’t feel like someone who is getting too many power-ups or going beyond fighting in his own weight class. Hakuno manages to develop into one of my most liked Fate protagonists with how he handles himself throughout the show. There’s no talking about characters in this show without talking a fair bit about Saber. 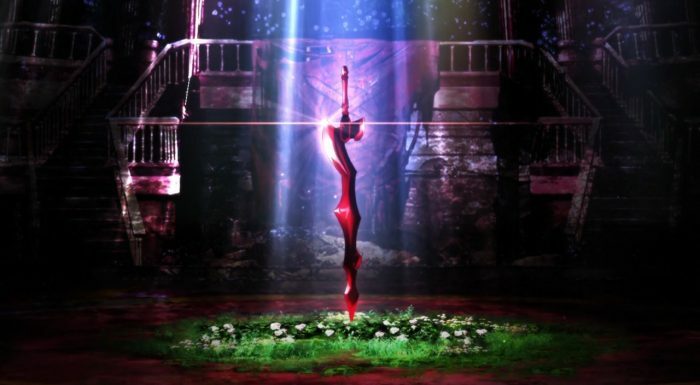 This is very much not the same Saber that we know from the standard Fate series nor is she remotely related to another blonde Saber of Red from Apocrypha. 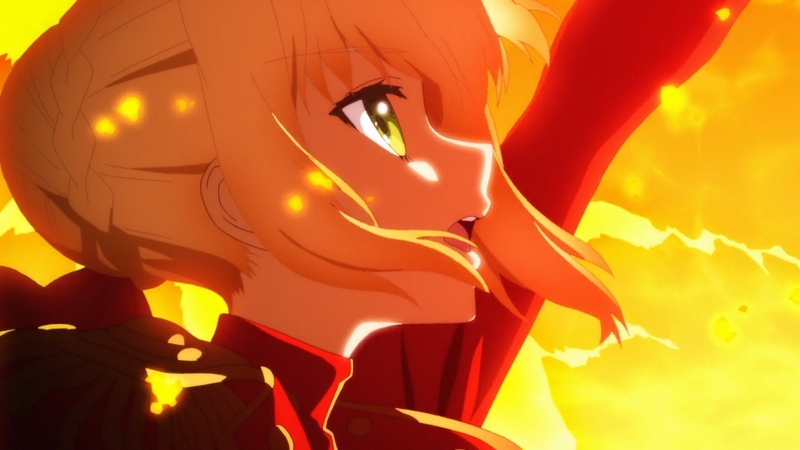 She is very much her own individual despite some visual similarities to previous Saber characters. Honestly she is probably one of the most fun main servants in the show. 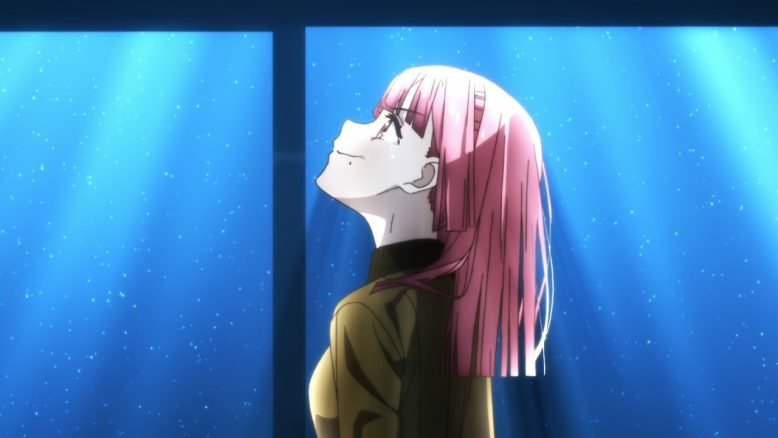 In some ways she does make me think of Fate/Zero’s Rider in terms of just bringing a massive amount of energy to every scene. She is a fun person who reacts in a very expressive way and that is honestly helpful in the early going when Hakuno isn’t very expressive. What stands out for me about her is her sense of aesthetics. 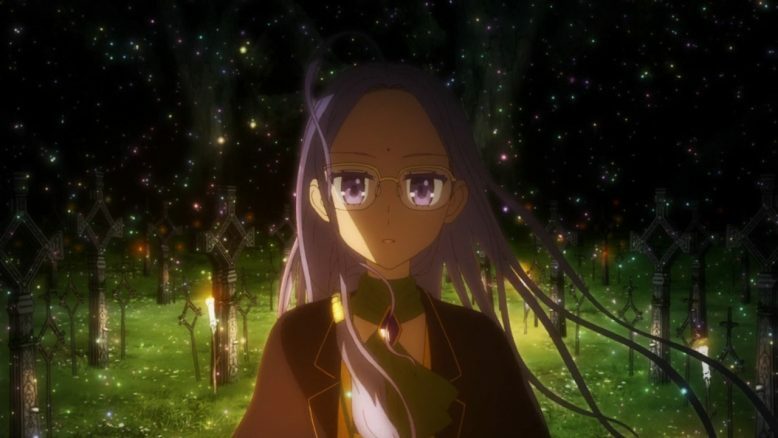 She doesn’t lack a sense of honor, but what differentiates her from other Fate characters is an appreciation of beauty. Not simply that she loves what looks beautiful, but beauty in spirit and personality. 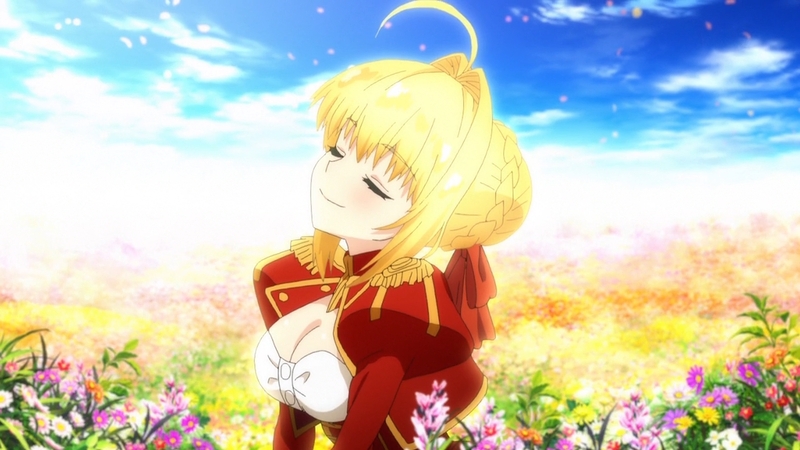 Saber is a character that does appreciate the beauty of the world, the flowers, music, and even the beauty in an intense life or death battle. This is a character that wants to or wishes that she lived beautifully and that personality rubs off on Hakuno as the show goes along. Now this isn’t a perfect character or someone without a troubled history. I doubt anyone who ends up summoned as a servant in this franchise has had a perfect background. Saber can very much lose her temper, not a fan of those that won’t fight head on, and can overestimate herself. 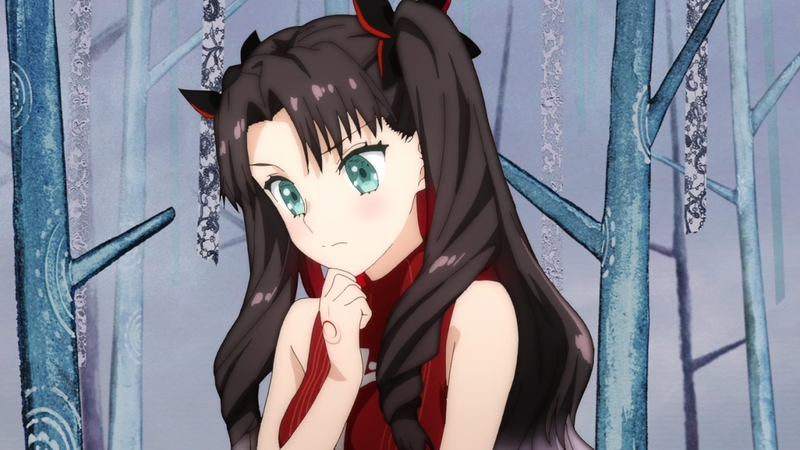 A lot of what makes Rin/Rani interesting is more plot related so can’t go into too much detail. Although I will say that while characters have the same faces and names as familiar Fate characters, the different histories at work with the Fate/Extra setting does mean that these aren’t exactly the same people that you might have seen in other Fate works. 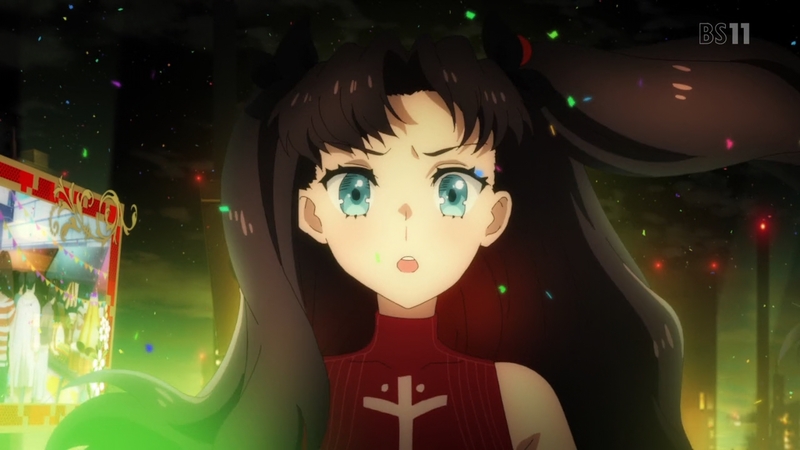 Although I will say that this version of Rin is just as entertaining and fun to have around as any other version of her character. With the nature of the setting and Hakuno moving through different areas, the antagonists do tend to be changed up as the story goes along. You just don’t spend a ton of time with many of them. Now this really doesn’t matter if you did play the game. But it isn’t the worst thing in the world without that either since most of them do get a fair amount of attention to their backstory. You may not spend more than a couple episodes with them, but for most of them you do get their motivations. I can see the different antagonists being a sore point for some though. However I do like how the antagonists that Hakuno must deal with either reveal something about Hakuno himself or help in advancing some character growth. I think the Fate franchise is often remembered more for the action than anything else. Really don’t think people praise the ufotable adaptations based purely on the story. I think in some ways that is a shame because there are some good stories being told within this universe. But there’s no doubt that action is part of the equation. Now I don’t think this series pushes that envelop to some new level or has some of the best fights in the show. And yet I actually still enjoyed the fights overall. This series adds more usage of skills and varied noble phantasms. Particularly in the latter part of the show they do show off some flashier attacks. The fights are not the best in the franchise. But I do think they are solid. There just is a lot of story and they aren’t the core of the story. Where this show shines visually is the atmosphere. There is a reason Shaft got in on this show. This is the studio behind series like Madoka. 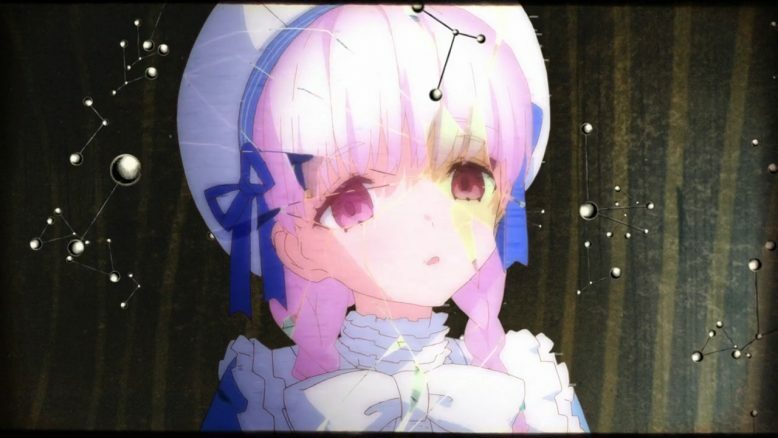 Fate/Extra is a show set within a digital space created by an ancient supercomputer that is part of/inside the Moon. You don’t just need great animation, but a great sense of style of bringing that weirdness to life. And they honestly nail it with this series. 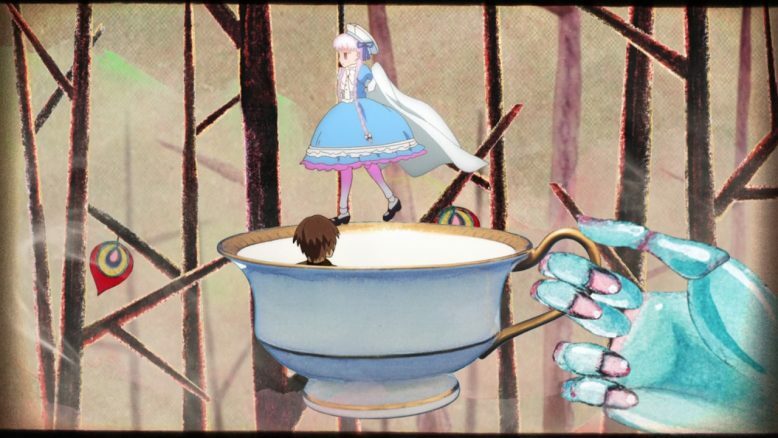 The weird parts, the visual symbolism and clues are all handled extremely well. Some of the early episodes especially capture a feeling of “this place is pretty nuts.” And honestly that works really well to get across how very wrong things are within that place. Character designs work just fine. Even similar characters do have a different general appearance from other Fate adaptations which is fine. It is Shaft so be prepared for crazy head tilts here and there. There is also some fanservice and bath scenes. But at least in this case it is pretty equal opportunity. And generally speaking they only keep showing off either of the main characters to those kinds of scenes. When things are serious they tend to keep the focus on everyone’s faces. The voice cast is really good. They do grab familiar voice actors for familiar character names so no one sounds wrong. The music works really well. I found some stand outs just being the ones for just casual conversations between the main characters and sure the ones saved for big action scenes. Everything just seemed to fit nicely for the respective scene. I’ll give a nod to the OP/ED combination of this show which I just never found myself skipping over. The ED especially did change up a little depending on who was a major character in that episode which I found nice. This is a tough one because I can’t speak for those that never played the games. 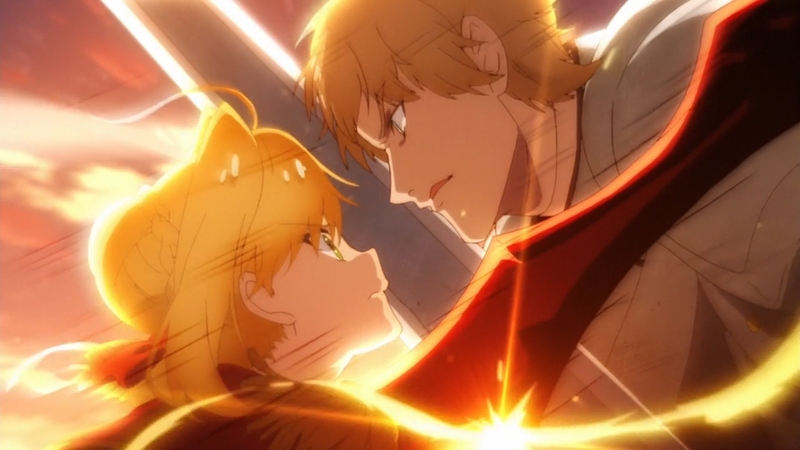 In this case I cannot cut out what I know and experienced in playing the Fate/Extra game to watching this show. So that bias is very much there and everyone will just have to accept that. But I honestly really enjoyed this show. It took so many interesting twists and went places I didn’t expect. For me it was fun going through each episode noticing what seemed unusual and trying to solve the mysteries the show was presenting. Whether it was the bigger mysteries regarding the plot itself or what individual characters were trying to accomplish, both were fun. We get introduced to a very different setting for a Fate series with this one. A lot of questions are raised and you are left guessing for a fair amount of the run time. But I do think that they do openly give you answers and the chance to piece everything together. We get to see the steady development of a good main character for this franchise and one of the more fun main servants we’ve had so far. The fights are solid, but don’t drag on for very long. There is a lot of talking, a lot of world building, and focus on character growth. I don’t think there is a perfect show out there. And this one certainly isn’t perfect. I don’t think it will appeal to those that care mostly about action in a Fate series. It could very well not work for those that haven’t played the Fate/Extra game. It may very well be a really good show for rewatching since you can pick up on so many things when going through it again. A lot of elements just fit even better when you know what the big picture is. What I will say is that anyone curious about this one should check out the first three episodes. This is one time where the 3 episode rule really works kind of perfectly. You get the introduction and a good amount of the story within those episodes. If you have any interest in it after that then you should be good for the rest of the run time. I don’t think it’s a bad idea at all to play the original game if you have the time or interest (I suppose a let’s play works too). It was a good game despite some of the gameplay in the combat not being amazing. I can’t avoid giving this show an A. Because for me that is exactly what this show is. They told a good story over what was effectively 14 episodes (the last part of the story released as a couple specials, but time wise they were effectively 4 episodes). The action worked fine for me, the visuals/atmosphere was great, I really liked the main characters and got enough from the antagonists to keep me invested. The show is one that I will be missing.